Local pickup will be available only when item is described as Local Pickup Available. Devices with a serial numbers will be recorded, any device without a serial number will be inconspicuously marked. Devices with a serial numbers will be recorded, any device without a serial number will be inconspicuously marked. Local pickup will be available only when item is described as Local Pickup Available. Selling a toy collection? Message me. Figure Condition: New in package and unopened. Comes as shown. Transformers Triple Changer - Blitzwing - Vintage G1 1985 - Near MISB AFA IT!! Near Mint in Sealed Box - Near MISB! 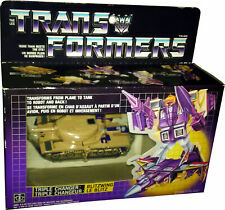 Triple Changer - Blitzwing - Ground and air Commando! "Destroy first, think later". Flies at mock 2.7, range 2700 km and has heat-seeking concussion missiles as jet. The plastic bubble has yellowed, is dent free and still firmly attached. There is a crack by the left foot (see pic). The card-back has age/edge wear and the hang-hole is torn (see pic). Condition: Sealed and comes as shown. Thank you. Selling a toy collection? Message me. Condition: Sealed and comes as shown. Thank you. Vintage Tonka GoBots GoBots Zero Factory Sealed Plane Transformers MOC NICE !! Vintage Tonka GoBots GoBots Zero Factory Sealed Plane Transformers MOC NICE !!. Condition is New. You het the exact item pictured. Actual item shown in picture. The b ox has only been opened for display/photography purposes. The manufacturer did not use tape to seal the box. The colors are vibrant and unfaded! Released In: 1985. Item is in good condition. Refer to photos for condition. Not a reissue! The Original Vintage Toy from 1985!! Ultra RARE Tonka GOBOTS mail way premium Road Ranger MOC toy w/ mailer contents! The envelope has a large tear on both the front and back, most likely from when it was originally opened. This has not been opened. The card is not perfectly straight but is fine. Good luck. All of the major websites and identification books break down the toys this way and so do I. Weapons/Accessories:100% complete. Good condition. It is never my intent to "rip" anyone off. So I will get back to you as soon as possible and I appreciate your patience. Transformers Insecticon: Shrapnel - Vintage G1 1985 - New MISB AFA IT!! Mint in Sealed Box - MISB! Actual item shown in picture. It Has Never Been Opened. A master of electricity, his dark desires puts this skill to use on his victims. Nothing delights him more than to see how they squirm from his touch! This is an original hasbro toy and not a KO or reissue. It is never my intent to "rip" anyone off. So I will get back to you as soon as possible and I appreciate your patience. Overall condition: This is still in new unused condition and has not been opened! In great condition and then box is not in mint condition, please pay close attention to the photos before purchasing. GoBots-Tonka GoBots-Regular-Zero--Sealed MISB MOSC. We are buying! TFL ID N8872. This lot consists of the following Renegades GB P2. Renegades GB P3. Renegades GB P4. Vintage G1 Transformers Optimus Prime Eraser NOS Hasbro Spindex 1985. Condition is New. Shipped with USPS First Class Package. 1985 Go Bots Power Suits Armor For Renegade GoBots by Tonka! New Sealed! 1985 Go Bots Power Suits Armor For Renegade GoBots by Tonka! New Sealed! Please see pictures for details. We combine shipping. Be sure to follow us and check our other listings for more great vintage toys and video games. THANK YOU! Includes 8 color picture cards and one motto sticker. The plastic covering has a crack not visible in the photos. Insecticon Bombshell. AFA GRADED. AFA #17452155. Bombshell Will Be. Star Wars AFA Graded. WINDOW : 80. And Wrapped with. Confirmation And. It is still factory sealed. Are you wanting to get the most for what you found or don't want any longer?. I don't like to wait and you shouldn't either. Blue Firebird. issued 1985. SOLD AS IS. 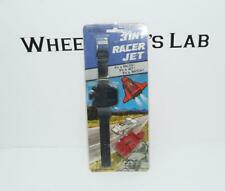 Vtg GOBOTS Super Rare SKY FLY Odd Ball Tonka Robot Jet Action Figure '86 Go Bot. Condition is New. Shipped with USPS First Class Package. We are buying! TFL ID N8806.